Fowl Play Studios Inc. was founded in 1995 by Jeffrey Moore and is located in Rising Sun MD. Jeffrey Moore began Fowl Play Studios as an endeavor to create gallery quality decorative waterfowl sculpture for sale in galleries nationwide, provide up to-date carving and painting instruction, create new tupelo machined blanks for the carving enthusiast. Jeff began making his own original masters for duplicated birds after having been invited to the Easton Waterfowl Festival. Students soon asked if they to could carve and texture these turned birds. New Masters were created and blanks became very popular, as Jeff's blanks and classes provide a way to simplify the rough carving process. Craftwoods has displayed Moore's birds for the past five years in their catalog. 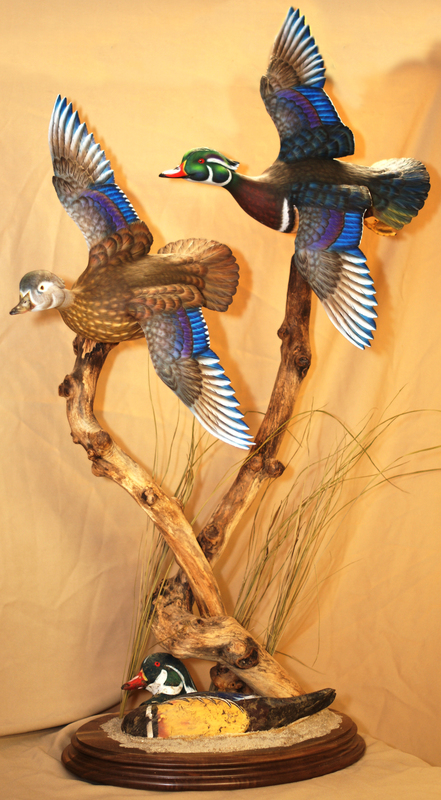 Fowl Play Studios now carries over forty popular duplicated decoys and birds enjoyed by carvers all over the country. Still, many of the students have their own ideas and may be working on a competition piece that requires an original pattern and cut out. This will always be a vital part of teaching and often leads to new or improved master concepts. Classes are ongoing, running continuously year round in a casual, relaxes atmosphere, and open to anyone who would like to attend. There are four weekly classes, so space is not usually a problem. The average number of students per class is between eight and twelve. All are carving at different levels and on different projects. Jeff receives positive feedback using this format and has always said that anyone can learn from someone else, regardless of individual level, age or background. Please tour our website to see everything from Jeff's latest work to the complete line of duplicated rough out, and also more information about the sculpture classes we offer.